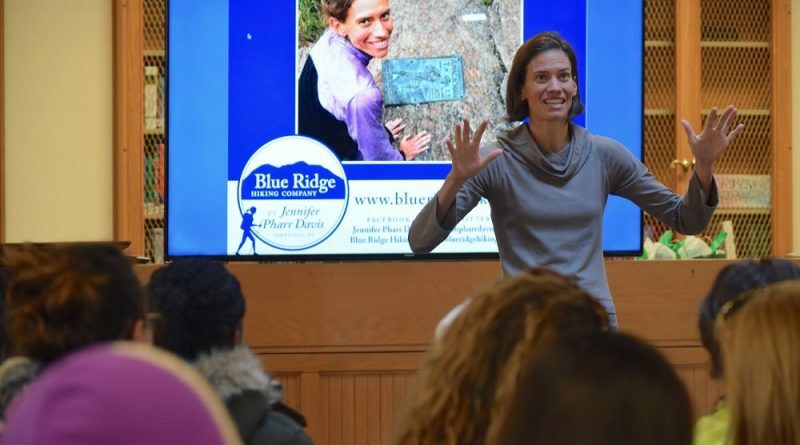 Traveling the world to hike thousands of miles, setting world records and encountering life-changing events are just some of the experiences the Foxcroft School’s keynote speaker talked about last weekend. Jennifer Pharr Davis, 34, addressed a group of 150 girls at the school Saturday in Middleburg, after being named the 2017-2018 Allison Harrison Goodyear Fellow. Davis is a record-breaking hiker, having trekked more than 13,000 miles on six continents and traversed the Appalachian Trail three times. Davis’ talk on Saturday came during the school’s first ever Wellness Weekend, which focused on activities and seminars that emphasized girls’ emotional and physical development. Wellness Program Director Meghen Tuttle said the program focuses heavily on internal and external struggle and teamwork, which she said Davis exemplifies. In talking about her hiking experience, Davis brought everything back to a common reality by touching on the themes of perseverance, strategy, teamwork and self-worth. Saylor Hart, a senior at Foxcroft, said Davis empowered her by talking about ignoring the external pressures in society to better focus on individual goals. Tuttle said the school selected Davis as this year’s fellow and keynote speaker because she has a different kind of story to tell. Davis’ first hike on the Appalachian Trail came as a solo trip in 2005 at the age of 21. Starting her hike in Georgia as a novice with her brother’s old Boy Scout gear, her hike was anything but a typical backpacking trip. Along the way, Davis was struck by lightning, gained the unwanted company of a male hiker, had her eye frozen shut in a snowstorm, got 137 mosquito bites in one day and found herself as the first person to arrive on the scene of a suicide. What Davis has been doing since then is hiking all over the world. She has hiked the Camino de Santiago in Spain, the Cotahuasi Canyon alongside missionaries in Peru, multiple trails around Hong Kong and in mainland China, the 19,000-foot-tall Mt. Kilimanjaro in Africa and the 600-mile Bibbulmun Track in Australia, which is modeled after the Appalachian Trail. Even after all of her journeys abroad, Davis said her favorite trail to hike is still the Appalachian. In fact, hiking internationally has made her appreciate the trail more than ever, with all its biodiversity and friendly community of hikers. After hiking the trail for the first time 13 years ago, she decided to hike it again just 12 days after marrying her husband, Brew, in 2008. This time, she hiked the trail in 57 days. It was at that point that she thought about setting a record. Three years later, she did that. In 2011, Davis hiked the trail in 46 days, 11 hours and 20 minutes to set the overall speed record among men and women, hiking an average of 46 miles each day. Now married with two young children, Davis’ plans to set records and go on long excursions have died down a bit. She is, however, planning to hike the 300-mile Pinhoti Trail in Alabama and Georgia this year. Her newest book, “The Pursuit of Endurance,” is also set for release in April. Davis said the book includes stories from other successful hikers and how they have matured through their journeys, just as Davis has.